1st Platoon A. Company 643rd TD BN. Battle Stars"Ardennes - Rhineland - Central Europe"
Virgil Dragomani was living in Escondido, CA near his daughter and son for the last 2 years. After raising their family in Hudson, MA Virgil and his loving wife, Florence, moved to Lunenburg, VT in 1987. They loved living on their ten acres of land and over the years they enjoyed hunting, fishing and snowmobiling. After 61 years of marriage, Florence passed away in 2007. Virgil was a WWII combat veteran and served in the U.S. Army in the 643rd Tank Destroyer Battalion. 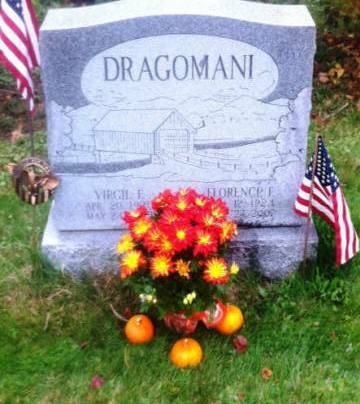 He was the son of Avdazio and Maria Dragomani of Southboro and grew up there during the depression along with his sisters, Gena and Ida and brothers, Andrew and Leo. Virgil was a hardworking man that took very good care of his wife and family. He was a true nature person who loved the outdoors and always had a big garden. Virgil is laid to rest alongside his wife at Southboro Rural Cemetery below their headstone designed with a Vermont Covered Bridge.